I found this little Harmony guitar at a thrift shop for ten dollars. It was pretty beat up to say the least. At the time the pictures were taken I had already removed a lot of puff paint and stickers. What is left here are all the sharpie art and "etched graphics" that could not be easily removed. As you can see, it was most likely used as a melee weapon in the past. It had many large gouges and the entire back panel was seperated from the body in multiple places. Many of the internal braces were split or broken away from the glue so they would flap around inside. 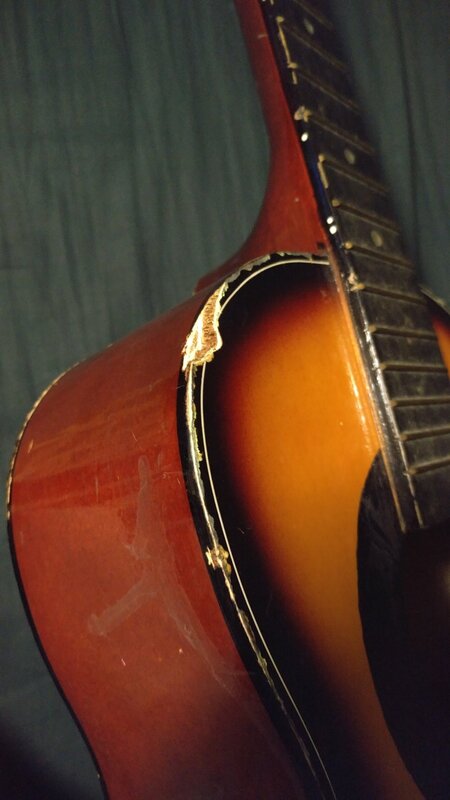 And of course the bridge was pulling up away from the body of the guitar. My first task was to glue the back panel back onto the guitar and sure up the internal braces. Little bit of sanding off the old glue and a well placed roll of old duct tape does wonders. I also cleaned up the neck joint with some more glue. I might go back and scallop the braces but I haven't decided if its worth the trouble yet. Even though it is just garbage birch wood, it still cleaned up well. I reset and sanded the bridge as well as added a few design elements. I also repaired the tuning machines and replaced some missing screws and parts. After a pretreatment stain and a set up, the little guitar is back to a playable condition. I made a guitar strap for it out of an old bike tire tube. And while it might not be the best guitar in the world, it is 100% playable and stays in tune.